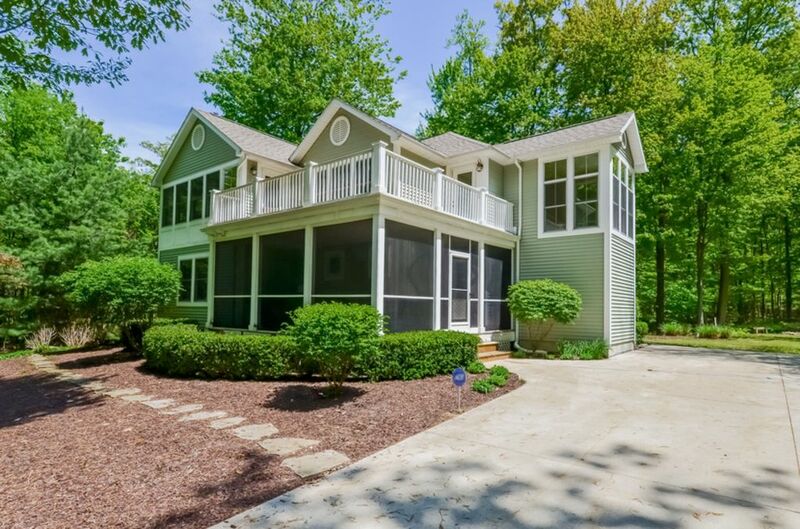 Excepcional, arejado, expansivo, casa é definida em um lote arborizado, tranquilo e privado, a poucos passos da associação compartilhada da praia do Lago Michigan. Três níveis espaçosos reúnem o melhor do lazer e recreação com jogos de salão e atividades ao ar livre. Piso plano aberto perfeito para grandes reuniões familiares, mas também permitir a privacidade individual com muitos quartos, incluindo 6 quartos e 5 banheiros. Mergulhe na banheira de hidromassagem ao ar livre para 6 pessoas, com chuveiro ao ar livre nas proximidades. Aproveite o sol e as vistas do Lago Michigan no deck do segundo andar e na sala do observatório, com bar molhado. Desfrute de fogueiras em uma área privada e isolada na propriedade, bem como na praia privativa. Quilômetros de caminhada sem fim, corrida, caminhadas, ciclismo, natação e vida selvagem adjacente à propriedade. Aprecie os centros de Saugatuck e Douglas, onde você encontrará inúmeras lojas, galerias de arte, restaurantes, cultura e vida noturna, tudo a uma curta distância de carro ou de bicicleta. Muitos campos de golfe e numerosas fazendas de frutas de u-pick na área, incluindo (sazonal): morangos, mirtilos, framboesas, cerejas, pêssegos e maçãs. Palavras-chave: Localização Saugatuck-Lake Michigan Beach Home-Privada; Praia privada; menos de 5 minutos das cidades de Saugatuck e Douglas. The property is insane and beautiful! We all had the best time and enjoyed the character of not only the home but, the neighborhood and town. Nick was very helpful and very personable when it came to the area and what to do! Highly recommend and would stay here again! The grill was dirty and the owner of the house didn't say that the private beach was flooded until the house was rented. Overall pretty bad. Very sorry about the grill. We have since replaced it with a new one. Our former cleaning service was supposed to have checked it and cleaned it after every stay. They did not. So, we have a new service that will maintain and clean grill. As for beach...this is the first year that our beach has been under water, do to many issues; heavy rainfall; lake affect snow in winter and now, run off from Lake Superior being dumped into Lake Michigan. As a result, our property, as many like us in the area, has felt the affect of this. We hope to have the beach back. We do have a great, large deck that can be used in lieu of beach, and nearby, we also have Oval Beach and Douglas Beach, which can be used. I am sorry those issues did not make your stay at our property satisfactory, but you did not mention the many onsite amenities that our property allows guests...from outdoor hot tub, fire pit, front screened in porch, back deck, great room, finished basement with pool table and ping pong table, privacy, and close proximity to downtowns of Saugatuck and Douglas. Very, very, sorry you did not enjoy your stay....but we will work to make future guestsh stay the best it can be! We came to Saugatuck for my son's wedding at the Felt Mansion and needed a place for 14 people. The house had 6 bedrooms and 5 baths.. We were all able to get ready at once. The beds were extremely comfortable, the house was beyond clean and the surroundings....well I would say just rent it and see. Nick was so helpful and I can't thank him enough for sharing his home. Skillet needs to be replaced. Squeaky beds were most annoying (many had very little sleep from noise). House offers basics but no upgrades for price of rent. Great home in a beautiful area! Overall we had a wonderful time here. We enjoyed many sunsets, walks and visits to the beach. The owners were very responsive to a few needs that we had. Great week, great fun! There is an extra $25.00 a day fee for pets not included in this total.